Update: this class has sold out! If you want to be alerted to future flame effects classes, please drop me an email at Lee at Lee dat org! 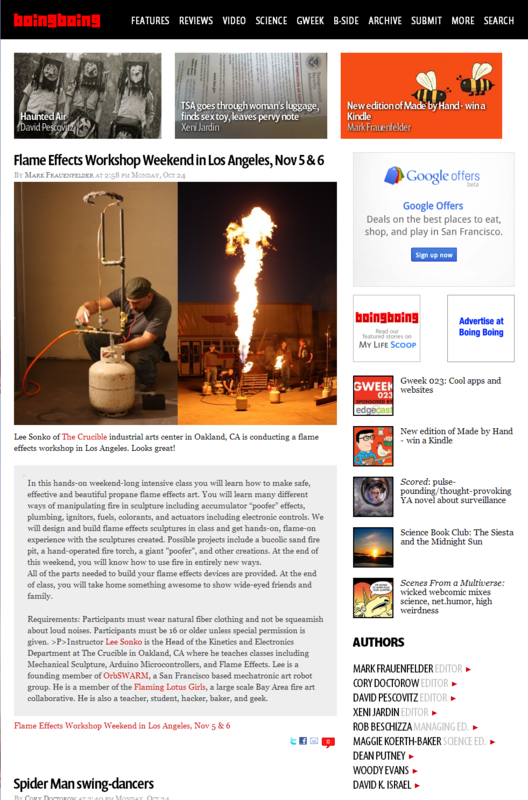 I’ll be teaching an intensive Flame Effects workshop on the weekend of November 5 and 6 2011 in association with Machine Project in LA. Wanna go? Sign up on the Machine Project website! This workshop is NOT taking place at Machine Project. This workshop is instead at Keystone Art Space, address below. Become a Machine Project Member and receive a discounted rate on all classes! In this hands-on weekend-long intensive class you will learn how to make safe, effective and beautiful propane flame effects art. 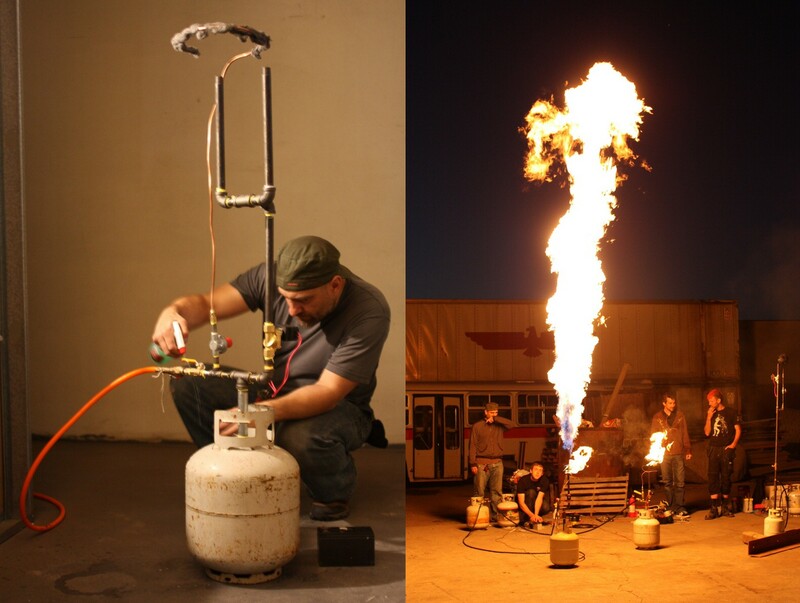 You will learn many different ways of manipulating fire in sculpture including accumulator “poofer” effects, plumbing, ignitors, fuels, colorants, and actuators including electronic controls. We will design and build flame effects sculptures in class and get hands-on, flame-on experience with the sculptures created. Possible projects include a bucolic sand fire pit, a hand-operated fire torch, a giant “poofer”, and other creations. At the end of this weekend, you will know how to use fire in entirely new ways. All of the parts needed to build your flame effects devices are provided. At the end of class, you will take home something awesome to show wide-eyed friends and family. Requirements: Participants must wear natural fiber clothing and not be squeamish about loud noises. Participants must be 16 or older unless special permission is given. Instructor Lee Sonko is the Head of the Kinetics and Electronics Department at The Crucible in Oakland, CA where he teaches classes including Mechanical Sculpture, Arduino Microcontrollers, and Flame Effects. 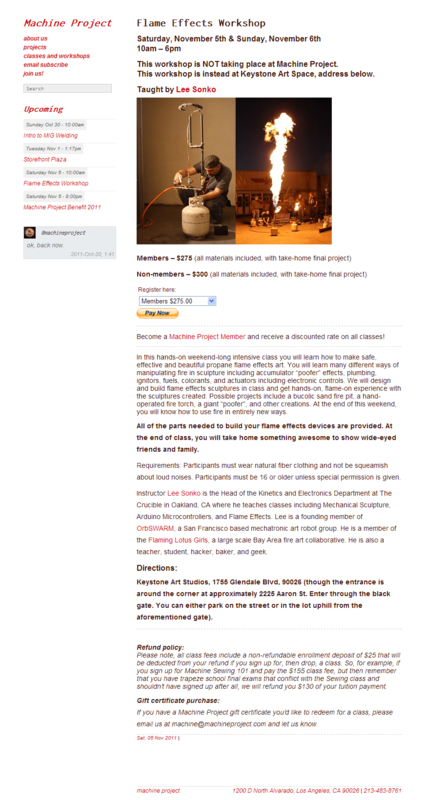 Lee is a founding member of OrbSWARM, a San Francisco based mechatronic art robot group. He is a member of the Flaming Lotus Girls, a large scale Bay Area fire art collaborative. He is also a teacher, student, hacker, baker, and geek. Keystone Art Studios, 1755 Glendale Blvd, 90026 (though the entrance is around the corner at approximately 2225 Aaron St. Enter through the black gate. You can either park on the street or in the lot uphill from the aforementioned gate). Please note, all class fees include a non-refundable enrollment deposit of $25 that will be deducted from your refund if you sign up for, then drop, a class. So, for example, if you sign up for Machine Sewing 101 and pay the $155 class fee, but then remember that you have trapeze school final exams that conflict with the Sewing class and shouldn’t have signed up after all, we will refund you $130 of your tuition payment. If you have a Machine Project gift certificate you’d like to redeem for a class, please email us at machine@machineproject.com and let us know. My class topped BoingBoing.net just a moment ago :-). Thanks to Mark Frauenfelder for posting and asking me to bring the class to LA in the first place.